Sue was extremely patient and responsive during the entire buying process. I would recommend Toyota of Rockwall to anyone in the Market for a car. Jonathan was very profesional and gave exceptional service. Contacted dealer about new vehicle two weeks ago. Phillip was courteous and prompt with service and worked with me. After looking at trucks, I tried other brands and dealers and ultimately decided to come back and look at pre-owned vehicles. Again, Phillip was prompt and responsive with my requests, and was willing to deal fairly regarding trade in as well as negotiation of a 2017 Tacoma I was interested in that they had on the lot. I spent a grand total of less than 3 hours at the lot over 3 different visits and each time every effort was made to meet my schedule. This is my second vehicle to purchase from Toyota of Rockwall and my first pre-owned. Both times the service was great. We had a very good experience working with Brian Dial. Every thing went smooth and he was very strait forward. My wife and i will definitely do business here at the Toyota of Rockwall. Was an excellent 2. Will return for our next vehicle. Brian Dial made our car buying experience not only painless but enjoyable. He was very attentive to our needs and listened to any concerns. Highly recommend Brian! Visit Toyota of Rockwall's profile on Pinterest. Why Do So Many Toyota Drivers from Rockwall, Garland, Richardson, Rowlett and Dallas Trust Toyota Of Rockwall? While we could try to think of an all-encompassing response, we prefer to break it all down for you, step by step. That way, all of the bases are covered, and you can feel at home from the moment you walk through the Toyota Of Rockwall showroom doors. Aside from offering a great selection of critically acclaimed new Toyota models, we also keep an extensive catalog of used cars on hand. What's more, our auto financing gurus are ready to turn you from a shopper to owner, on your terms. That means finding a car loan and Toyota lease that you're comfortable with. Toyota Of Rockwall isn't, however, just a great resource for shoppers. Owners love our onsite car service and maintenance department. Staffed with highly trained technicians using only the finest Toyota parts, it subtracts the headache from the car-care equation. 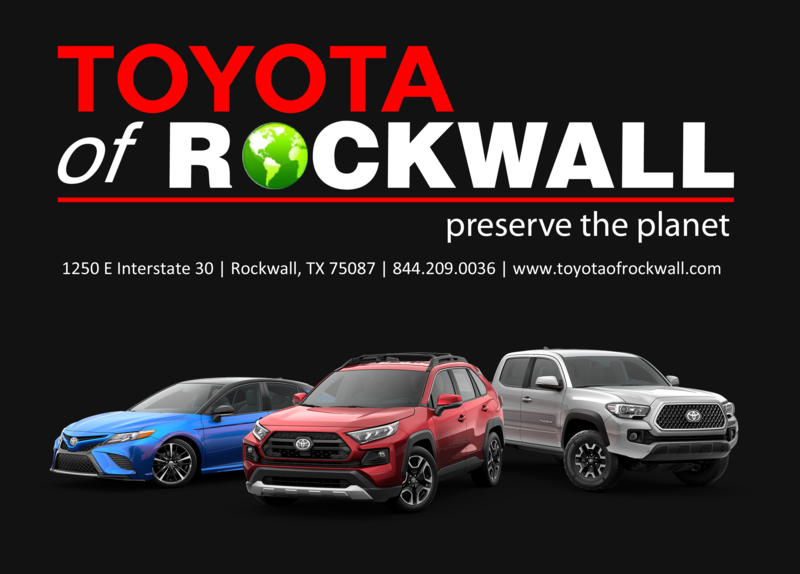 From beginning to end, Toyota Of Rockwall is by your side. If you're interested in any one of the number of products or services we have to offer, simply stop by and see us today. Located at 1250 East I 30 Rockwall, Texas, we're a short drive away from Garland, Richardson, Rowlett, Plano, and Dallas.